Universal, widescreen 1.85:1/16x9, languages: English DD 5.1 [CC] & DTS 5.1, subtitles: none, single side-dual layer, 18 chapters, production notes, cast & filmmakers bios, theatrical trailer, rated R, 131 min., $29.98, street date 12/14/99. Directed by Francois Girard. Starring Samuel L. Jackson, Greta Scacchi, Carlo Cecchi, Jason Flemyng, Jean-Luc Bideau, Sylvia Chang. An epic adventure of mystery and obsession unfolds when Charles Morritz (Samuel L. Jackson), an appraiser of rare musical instruments, discovers a one-of-a-kind, blood-red violin at a prestigious Montreal auction house. Convinced he's found an authentic long-lost masterpiece, Morritz uncovers the spectacular journey of the priceless violin, how it changed hands and the lives of all who touched it. When the violin's shocking secret is finally revealed, Morritz must wrestle with his own demons and choose between burying the truth, and risking everything. The Red Violin offers an unusual structure. It presents a number of vignettes from over the past few centuries. All these stories are connected by an object - the eponymous red violin. We see what happens to it as it passes from owner to owner. These tales are linked in two ways. For one, we see the progression of predictions from a fortune teller; back when the violin was created, she foretold its future, and we see these unfold bit by bit. Also, we view a current-day auction at which the violin will be sold; each of the vignettes informs us in some way about different bidders, and we also learn about Charles Morritz (Samuel L. Jackson), a man who restored the violin. While this construction is unusual and intriguing, the film itself, unfortunately, is not. Some of the stories are better than others, of course, but none of them did much for me. Ultimately, I found TRV to be a pretty dull and lifeless offering. TRV is the kind of movie I might respect but not one that I liked. It's just that not a whole lot of great interest happens in these stories. They're all pretty slow-moving and boring; the film has its gimmick but little else. Yes, it's pretty clever to shift time and place as quickly as the movie does, but I still would like to see something compelling. That happened pretty rarely in TRV. Probably the best vignette concerned a child prodigy. It shows this boy as he prepares for a big audition and ends with a "surprise" that was really quite predictable. Still, it was more interesting than the rest. One involving two lovers was completely banal, and another in Maoist China also failed to offer any stimulation; there's a whole lot of nothing happening. No, I don't require that every film I watch provide nonstop thrills, or even any thrills at all. Still, I'd sure like to see something interesting, not just some pretty dull stories about some folks who owned a violin. I've read a number of reviews that describe TRV as "haunting." I must disagree. It's been a few days since I saw it, and I'm actually having some trouble remembering much about the movie. It just kind of slipped away into the air, with very little aftereffect. I found the film to offer some very mild entertainment at the time, and then went on with my life. The subplot involving Morritz is probably the most interesting if just because it unfolds so slowly. We learn bits and pieces every few minutes and have to wait until the end to tie them together. The conclusion's mildly stimulating, though I'm not sure it was worth the wait. Still, it appears that director Francois Girard needed this carrot to make sure that the audience would stick around until the end; without the sustained mystery, I'd have bailed on this snorefest well before it finished. One other unusual aspect of TRV is that most of it features languages other than English. Actually, the film includes five languages: English, French, Italian, German and Mandarin. Each appears in the relevant scenes. This is an interesting presentation and does add some realism to the presentation, though it seems unnecessarily pretentious. But since the entire project is a pretentious trifle, I guess that stands to reason. The Red Violin appears in its original theatrical aspect ratio of 1.85:1 on this single-sided, dual-layered DVD; the image has been enhanced for 16X9 televisions. For the most part, the picture looks quite good. Sharpness seems consistently strong and precise with very few examples of moire effects or jagged edges. The print itself appeared fairly clean; I noted no examples of marks, spots, scratches or other damage, although the film did occasionally seem slightly gritty. Colors were pretty subdued throughout much of the film, but they seemed nicely warm and accurate; none of the hues really stood out, but the movie displayed a nice warmth that befit the topic. The weakest aspect of the transfer regarded its darkness. TRV is a rather dimly lit movie and the shadow detail does not seem as strong as it should. For the most part, it's pretty good, but it falters at times; poor Samuel L. Jackson often looks like a silhouette! Okay, that's a little extreme, but I nonetheless found the black levels to be too heavy and they tended to overwhelm the image. Still, TRV presents a generally nice image. Overall, the mixes are very similar, but I must give the edge to the DTS sound. It consistently appeared warmer with stronger low end, and it presented greater sonic detail. That seems to be the usual story with DD/DTS comparisons; they rarely come across as radically different, but the DTS versions tend to appear slightly more natural and deeper. That scenario repeats itself here. That doesn't mean you should be dissatisfied with the Dolby mix, for it's also good; I just preferred the DTS edition. The following comments will apply to it; across the board, they will also detail the Dolby version if one imagines it as being a bit less full-bodied and vibrant. Dialogue is consistently clear and intelligible throughout the film (well, when English is spoken, at least), and effects also seem quite natural; some very good bass appears at times. The music occasionally sounded a bit strident, but it usually seemed pretty clean and smooth. The soundstage of TRV appeared surprisingly wide and deep for this kind of film. The forward spectrum often offered good stereo effects usage, and the music always spread nicely across those three channels. Surround audio also involved both of these factors well; ultimately, the movie provided a satisfyingly engaging sound experience that nicely complements the film. Universal haven't offered The Red Violin as one of their "Collector's Editions" - the inclusion of the two different 5.1 tracks probably used up that space - so don't expect many supplements. The best feature appears as some very good text production notes that nicely detail the creation of the film. We also get a trailer and decent but unspectacular biographies for the director and four of the actors. Finally, a "soundtrack presentation" appears; this is nothing more than a brief advertisement for the soundtrack album. Surprisingly, TRV does not include a booklet with the DVD. Instead, a single sheet shows up in the case; it features some pictures and chapter listings. This sort of presentation would be typical for Disney or Fox, but is unusual for Universal. I hope this doesn't start a trend. Ultimately, I can't recommend The Red Violin just because I found it to be such a dull and drab movie. It's the kind of picture that aspires to be beautiful and moving but simply falls flat. Both picture and sound are good, but few supplements appear to complement the package. If you're really interested, give it a rental; otherwise, skip this one. Official Site--Provides a pretty good account on the story, behind the scenes, and links. James Berardinelli's ReelViews--"The Red Violin may not succeed on every level, but it's still a pleasing and fascinating excursion." 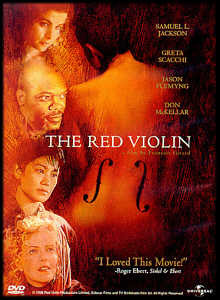 Roger Ebert--"The Red Violin has the kind of sweep and vision that we identify with elegant features from decades ago." MovieThing.com: Samuel L. Jackson--A great site for in-depth biography and credits. Violin Making by Hans Johannsson--"Welcome to the Violin Making home page. Among the things you will find here are: The works of Hans Johannsson, violin maker, including samples of sound and pictures of his instruments, a sequential description of the construction of a violin from A-Z. Also you will find entries on wood, varnish, glue, tools, design/proportion and instrument care." Movie Music U.K.--A full review of the original score soundtrack composed by John Corigliano: "It is very rare for a soundtrack to be embraced wholeheartedly and celebrated loudly by aficionados of both classical music and film music, but this is what has happened to John Corigliano's The Red Violin." Amazon.com--Available to purchase are the DVD at special discount and the original score soundtrack composed by John Corigliano.